In a recent article published by Engineering News-Record (ENR), the editors examine the current state of public-private partnerships (P3) in the United States. The number of P3 projects across the country is on the rise, as more states allow for P3 or gap financing to fund transportation and social infrastructure projects. Indiana has established itself as a national leader in P3 projects. The Indiana General Assembly passed legislation over the last several years authorizing the Indiana Finance authority to enter into public-private partnerships. 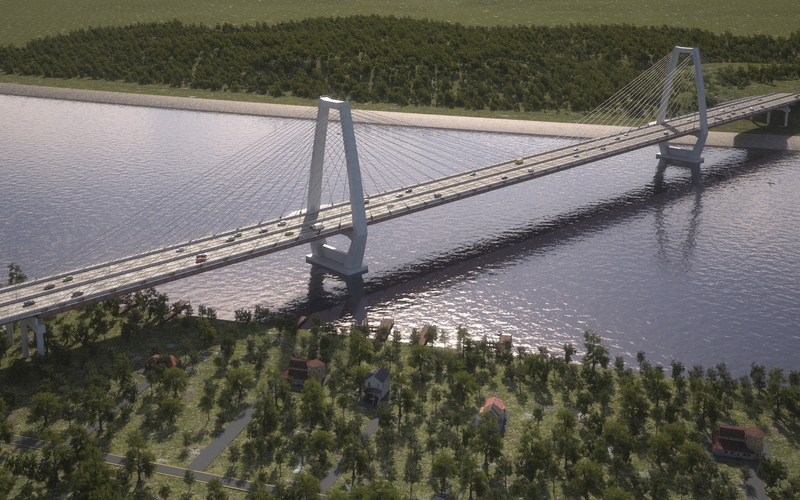 American Structurepoint is a part of one of the biggest transportation infrastructure P3 projects in the country, the Louisville-Southern Indiana Ohio River Bridges East End Crossing project. The Concessionaire is WVB East End Partners, which is a consortium of Walsh Investors LLC, VINCI Concessions, and Bilfinger Project Investments. The prime construction contractor is WVC, which is a joint venture between Walsh Construction and Vinci Grand Projects. American Structurepoint is serving as a sub-consultant to the lead design firm, Jacobs Engineering Group Inc.
Cash works closely on the contractor and developer side of P3 projects. From his experience working on the Ohio River Bridges project, he expects more states to use this mechanism since it gets the job done faster. “It’s just another tool in the tool box. I think you will begin to see more states developing moreP3’s because it’s a great mechanism to leverage private investments to help fund transportation as well as other social infrastructure projects, especially since the federal government hasn’t been able to increase funds available for projects,” said Cash. In the ENR article, the editors discuss a P3 delivery method that’s gaining more momentum in 2014 on a wide variety of social infrastructure projects as agencies put procurements together and build new relationships. The Illiana Corridor project, an east-west transportation corridor from I-55 in Illinois to I-65 in Indiana, is an example of the momentum shift. Agencies from neighboring states are using the P3 project delivery mechanism as a vehicle for project delivery to meet the public’s needs. Craig has worked more on the owner side of P3 projects, serving on both the I-69 Section 5 and the Illiana team which American Structurepoint, Inc. was part of the HNTB technical procurement advisory team for INDOT. This team assists INDOT in the development of procurement documents, specifically, the preparation of a reference design and technical provisions which outline the desired performance of the future infrastructure but provide flexibility in the final design in such a way to encourage innovation. “The better we write the technical provisions to allow for innovation, the better value the owner will receive. We also help them manage risk,” said Craig. A risk that both Cash and Craig believe more state and local agencies are willing to take, as they strive to build, repair, rehabilitate and replace transportation and social infrastructure with limited funding currently available. To read more about the current state of P3 projects in ENR, click here.